Solid. Nothing more ,nothing less. A strong card, even if somewhat uninspired. Do like this is essentially a flanking strike for spell hunter. Granted, you losing the tempo you get from flanking strike for the card advantage this card provides. I legitimately like the card a lot. Well, that's a fine card, but I still don't like pushing the Hunters towards spells.. They are doing that since KnC and you realising that now ? The spell itself is a bit bland but outside that, it is pretty solid. It pretty much replaces itself (with the chance that you can get another one to make a cycle). Flanking Strike, but balanced. I like it. I guess it's a downgrade of Flanking Strike . A little bit more flexible since you have a choice and 1 more damage, but you have to pay the spell you choose and miss out on a free board presence. I have no clue whether this will be playable, but it seems possible with so many value cards in this expansion. Maybe if tempo will not be as important as it was in the past otherwise it appears a little bit slow. Zul'jin synergy is okay (not as good as something that actually builds the board). Wing Blast still exists and I think is better. Can't go face, so that's disappointing with the new Legendary weapon girl. Meh. On the outside fringes of playability without any further synergies. I think it is way too slow, losing too much tempo and I think you can't afford that as a hunter, hunter relies on tempo to win games. So yeah this is bad. I think the spell is pretty good, if it were given to a different class. Hunter didn't use Wing Blast in their mid-range build even when this archtype grew on popularity. So I doubt this will see play due to its relatively high cost and low-tempo advantage, but who knows. 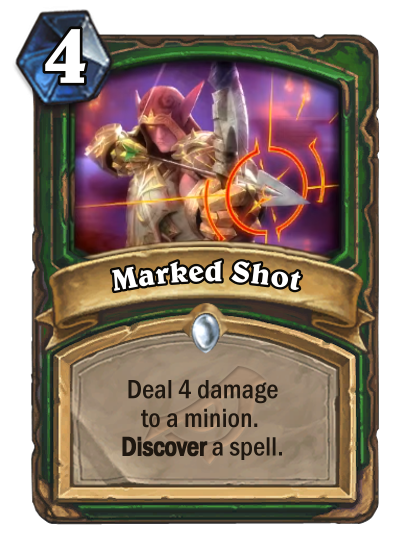 If hunter gets some cheap burn spells next expansion, then discovering an additional Arcane Shot, Kill Command and whatever we get next can be attractive (especially with Vereesa). So we should wait and see how the rest of the set goes. Inb4 this is bad with Zul'jin, as he can cast this spell on one of your minions and can give you a bad discovery option. A good replacement for the rotating Flanking strike. I would say it has the potential to discover itself and provide the Hunter with more removal spells throughout any given game, but Hunter's spell pool is kinda big... that's not necessarily a bad thing... nice little tool-box card. Good. No more 3/3 body to deal with.